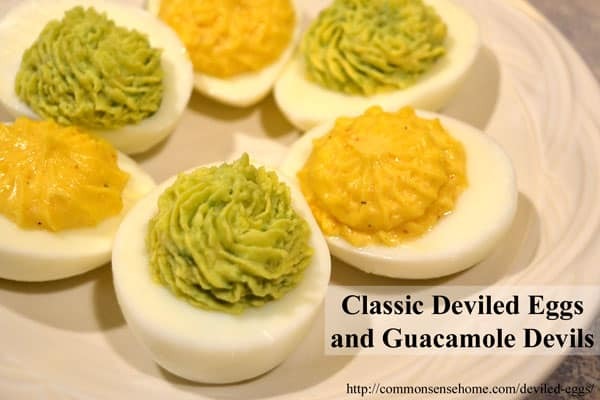 Classic deviled eggs are a favorite fun finger food when we have company over, but in recent years I've added a fun twist in the form of guacamole devils – deviled eggs made with avocado. Given that we live in Green Bay Packer country and the Packers are headed to the playoffs again this season, I thought it would be fun to share these easy to make snacks that also happen to sport the team colors. Cut hard boiled eggs in halves. Slip out yolks. Mash with fork or food processor. Mix in the rest of the ingredients. Refill whites with egg yolk mixture, heaping slightly. Serve chilled and store in the refrigerator. Note: I highly recommend the use of a pastry bag for refilling the eggs, because it makes the process so quick and easy. Pastry tubes are also great for making and filling cream puffs, mini tarts or cheesecakes; stuffing cheese filling into manicotti, and all sorts of other kitchen tasks. You can buy reusable decorating bags or disposable decorating bags. For these eggs I used a Wilton 4B large star decorating tip. Most tip sets come with a large star tip of some sort. To easily fill your decorating bag, simply invert it into a large glass or mason jar. Scoop in filling, twist or fold closed, and you're ready to fill deviled eggs in record time. I highly recommend the use of a pastry bag for refilling the eggs, because it makes the process so quick and easy. For these eggs I used a Wilton 4B large star decorating tip. Most tip sets come with a large star tip of some sort. To easily fill your decorating bag, simply invert it into a large glass or mason jar. Scoop in filling, twist or fold closed, and you're ready to fill deviled eggs in record time. 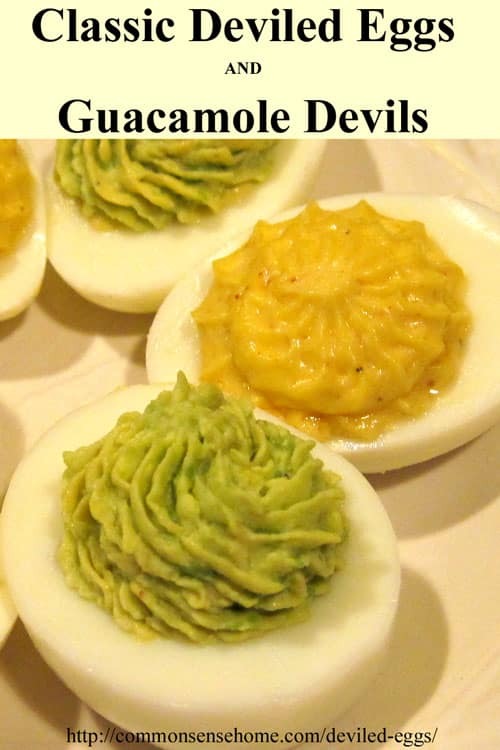 The Primal Blueprint free reader created e-book has a recipe for some extremely tasty Guacamole Devils, i.e., deviled eggs made with avocado. Cut hard boiled eggs in halves. Slip out yolks and scoop out avocado. Mash with fork or food processor. Mix in the rest of the ingredients. Refill whites with egg yolk mixture, heaping slightly. Serve chilled and store in the refrigerator. If you're traveling with your eggs or need to keep them chilled for a party, a storage case like the “Snap ‘N Stack Food Egg 2 Layer” may come in handy. One of the reviewers noted that you can invert the storage trays, fill them with water and freeze to create an ice block to keep your eggs cool. Very smart! It should be noted that the guacamole devils are most attractive when eaten the same day they are made, as the color fades in storage. If you need tips for boiling eggs just right and easy ways to get the peels off, check out “How to Boil an Egg“. Wow these eggs look sooo good. Gonna have to try these recipes, never thought of mixing avocado with eggs. Geez, don’t think I could stand the cold where you are. Here is SE Texas it has been cold and rainy but not near as cold as your area. I guess one gets used to it. Take care and stay warm. You do sort of get used to the cold, but I still don’t like it! I try to rearrange my schedule so I can hide inside on the worst days. The pantry and wood rack are pretty well stocked, and errand day is usually Wednesday, so hopefully it’ll warm up by then. Thank you for the recipes, I LOVE avocado and eat them with hard boiled eggs all the time, but never thought of putting them “IN” the eggs…duh! I have always made my families eggs with vinegar, sugar(raw), miracle whip ( no one likes mayo-go figure), mustard & a splash of Worcestershire sauce. After filling the “whites” they get decorated with olive slices, paprika & parsley.